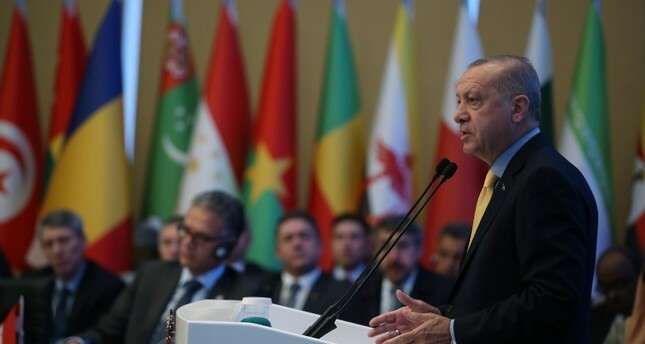 Speaking at the emergency Organization of Islamic Cooperation (OIC) meeting in Istanbul, Erdoğan said Turkey will never allow the legitimization of Israel's invasion of Golan Heights. About 20,000 Israeli settlers live in the Golan, which overlooks Syrian territory. The annexing of the area has never been recognized by the international community. Trump's latest move comes after he recognized Jerusalem as the capital of Israel and moved the US embassy there last year, which Erdogan strongly condemned. Erdoğan also praised New Zealand's Prime Minister Jacinda Ardern's empathy and reaction the terrorist attack last week in Christchurch, thanking the people and authorities of New Zealand for their sensitivity and determination in the face of such tragedy. He condemned the shootings, which killed 50 people, as a "brutal terror act" and called on New Zealand authorities to reveal the attacker's connections. The Turkish president asserted that the OIC cannot be indifferent to such events "that threaten the future of all humanity and the Islamic world," and called on the world to fight Islamophobia like "anti-Semitism after Holocaust'". "Just as humanity fought against anti-Semitism after the Holocaust disaster, it should fight against rising Islamophobia in the same determined fashion," Erdoğan told the OIC meeting. Earlier on Friday, New Zealand's foreign minister said in Istanbul that the mosque attacker will "spend the rest of his life in isolation in a New Zealand prison."